There are many reasons that you could result in a golf shot wave top to the ball so the club has only just caught the very top of the golf ball. It's going to produce a really low ball flight and one that doesn’t go as far as it possibly could. And there are many reasons that this can happen, and here we're going to look at the three most common. So first of all, the main reason that you'll hit the top of the golf ball is due to your grip pressure. You are squeezing the club too tightly as you squeeze the club and you make a fist with your hands, all the muscle start working in your arms and into your shoulders and if your muscles work they actually shorten. So even though you've started with the club touching the floor as soon as you set up and squeeze tightly, effectively the length of your arm shortens so you pull the club up away from the ball. And now if you keep holding at this really tight pressure you're going to hit the top of the ball. So first of all check your grip pressure if you are topping the ball. What I would do is squeeze as tightly on that golf club as you can, and we’ll call out a number 10. And the correct pressure to be holding at is a four. So take your golf club, squeeze as tightly as you can that’s a 10, half it, that’s five, and then just slightly loosen off and that’s a four. So you are now holding your golf club rather than squeezing it. So that’s the first main reason that you'll find that you hit the top of the golf ball. Okay the second reason that you might be hitting the top of the golf ball is when you set up ready to hit, you should set up with your left arm in a really straight position. 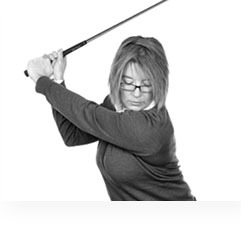 Now most ladies struggle to keep the left arm straight during the back swing and will tend to bend the left arm. So now the distance between your hand and your shoulder has shortened. So effectively, if you swing back in still with this bent arm position, you've effectively pulled the club head up away from the floor and you're going to hit the top of the ball. So second way to improve hitting that top golf shot would be that as you swing back work on keeping that left arm really straight and then as you swing down again keep that left arm really straight and you'll deliver the club head back to its initial start position. If you know that your grip pressure is good and you are maintaining that really straight left arm position then also consider your posture. You may be standing up during your back swing and then not dropping back into position on your down swing. You don’t want to stand up or have to drop, you want to maintain a consistent position and that will consistently let you bring the club back to the ball. So again as you start your golf swing you've tilted forward with a really straight back, if you swing the club back and you now stand up, you've increased the height of you above the ground and if you stay in this position and swing back in the club has now been pulled up away from the floor and you're going to hit the top of the golf ball. So work on maintaining a spine angle as you swing back, keep leaning forward and keep the same position as you swing back down. You should be rotating round this angle, rather than lifting out of position. So have a look at those three tips to help you improve with topping the golf ball and you should finally start to strike the ball a lot better.